Cantolopera Collection. Composed by Various. Cantolopera Series. Play Along. Softcover collection and Performance/Accompaniment CD. 60 pages. Ricordi #R139605. Published by Ricordi (HL.50486419). 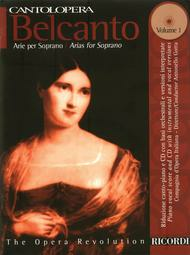 This edition includes vocal scores and a CD containing a complete version as well as an accompaniment-only version. It includes the lyrics and background notes in Italian and English and information on the Compagnia d'Opera Italiana.